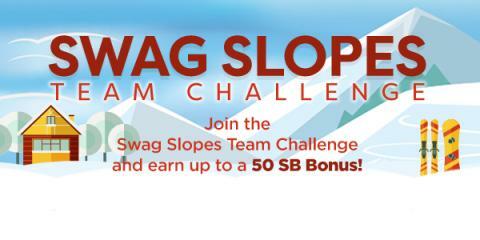 Being Frugal and Making It Work: Swag Slopes Team Challenge Starts Tomorrow ~ Join for FREE Today! All members who participate and contribute at least 400 points to their team’s total will receive a SB bonus in the form of a SB Swag Up Rebate! Members of the 1st place team will receive a 50 SB Swag Up Rebate, members of the 2nd place team will receive a 25 SB Swag Up Rebate, members of the 3rd place team will receive a 10 SB Swag Up Rebate.